Every month we feature some the past month’s bird sightings as suggested by our experts. Here are five remarkable observations from November. If you’re a fan of warblers, you probably know the mourning warbler, an uncommon bird of the eastern US that looks like it’s wearing a gray and black veil of mourning. 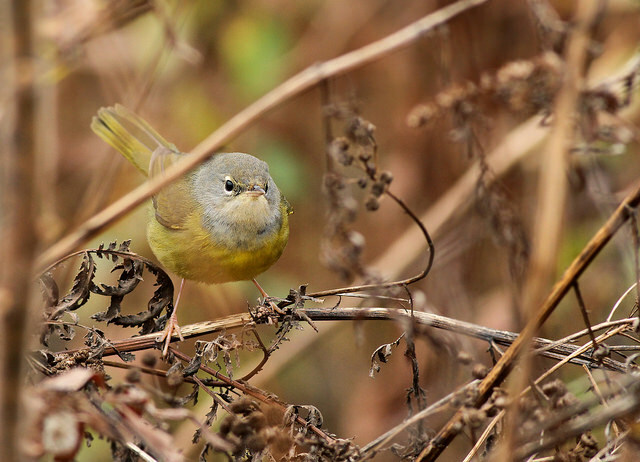 There’s a closely related species in the western US: the MacGillivray’s warbler. It has a similar appearance but has bold white crescents above and below its eyes. The ranges of these two species don’t typically overlap; nonetheless, a wandering MacGillivray’s warbler was seen last month in Lexington. 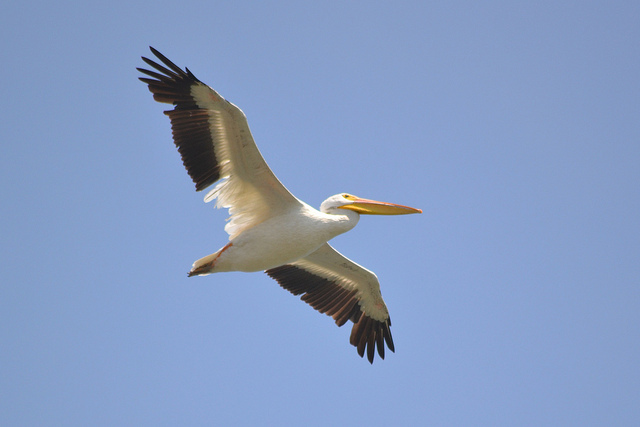 With a wingspan of nine feet, the American white pelican is one of North America’s largest birds. It breeds in central and western parts of North America and winters in the southern US and Mexico. If you’ve visited to the southern coastal US you’ve probably seen the brown pelican, a species known for making spectacular aerial dives to catch fish. The American white pelican doesn’t take such plunges; instead, it feeds by floating on the surface of the water and scooping up fish into its enormous bill. Last month, at least one white pelican was observed on a pond in Gloucester and later at Plum Island. This is a tiny dove—it’s just 1/4 the weight of a mourning dove. 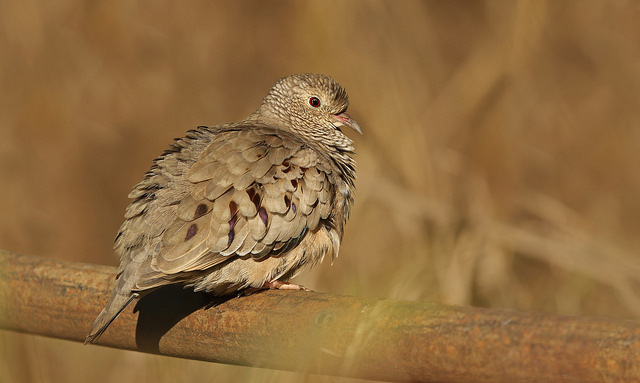 Native to southern North America and northern South America, the common ground-dove does not typically migrate, so it’s not clear why a bird made its way to Lexington last month. This species feeds and typically nests in dense vegetation close to the ground, which tends to make it vulnerable to many predators. Fortunately its feather pattern keeps it well-camouflaged against the dusty ground. When startled into flight, it flashes bright chestnut wing patches and its wings make a soft whirring sound. A true northern bird and a rarity in North America, the pink-footed goose breeds in chilly places: Greenland, Iceland, and Svalbard. It overwinters in northwestern Europe. Pink-footed goose populations are increasing, partly because of greater protection from hunting in areas where they breed. Accordingly, it seems, individuals are showing up on the eastern coast of North America with increased frequency. The species is gregarious, and in Massachusetts it’s usually seen in the company of Canada geese. 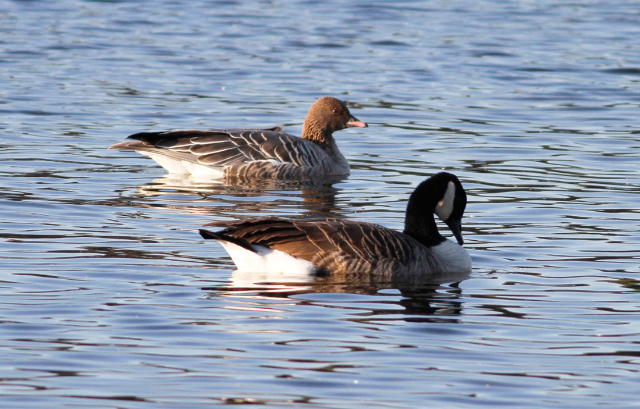 A single pink-footed goose was observed last month in a flock of Canada geese at Turner’s Falls along the Connecticut River. This uncommonly seen species nests in western mountain forests and usually winters at lower elevations. In winter, this bird eats berries, especially juniper berries, and fiercely defends food-rich territories. The Townsend’s solitaire looks a little like a miniature mockingbird, though it has a striking white eye ring and it’s actually a member of the thrush family. 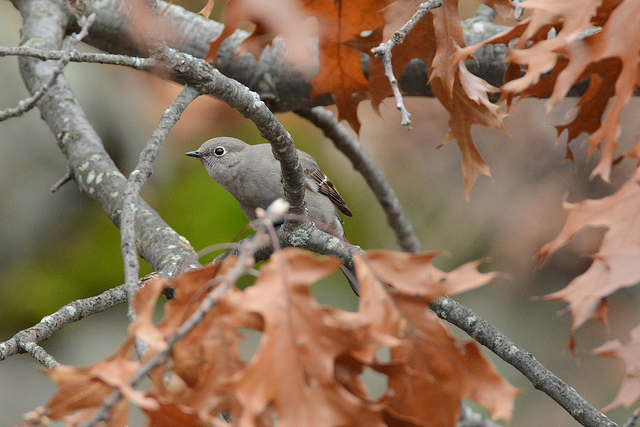 A Townsend’s solitaire seen last month at Halibut Point State park in Rockport was actually one of several reported this fall. This entry was posted in Nature Notes on December 16, 2015 by Rosemary.